The Canadian Motor Vehicle Safety Standard (C.M.V.S.S.) certification label is affixed as shown. 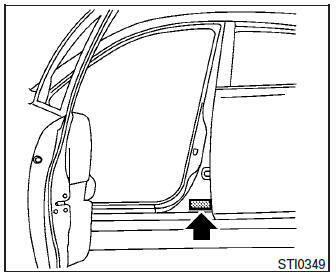 This label contains valuable vehicle information, such as: Gross Vehicle Weight Ratings (GVWR), Gross Axle Weight Rating (GAWR), month and year of manufacture, Vehicle Identification Number (VIN), etc. Review it carefully. The air conditioner specification label is affixed as shown.